Riverwest is a neighborhood in the city of Milwaukee bounded by the Milwaukee River on the east and south, N. Holton Street on the west, and E. Capitol Drive on the north. The neighborhood’s first development was at dams on the river in the mid-1830s—one located just south of present-day Capitol Drive, the other south of North Avenue. The southern dam was to be the head of BYRON KILBOURN’s proposed 50-mile canal connecting Milwaukee to the Rock River. That project failed after the 1837 depression, but a mile-long stretch provided waterpower for the city’s first manufacturing district, along what is now Commerce Street. The short-lived factory town of Humboldt was platted in 1850 west of the northern dam site; its name continued from the 1870s into the twentieth century, in a settlement of summer estates owned by numerous GERMAN-American business leaders, and along today’s Humboldt Boulevard. Other, less affluent German-Americans settled the western parts of the area in those same years. By the 1880s, a substantial settlement of POLISH immigrants was forming in the south and east. Their Polonia began around St. Hedwig Parish (1871) on East Brady and North Humboldt streets and expanded north across the river to an area the Poles called Zagora, meaning beyond the hill. (That was a reference to the grassy slopes of the 1873 city reservoir on North Avenue, or Zielona Gora, green hill.) St. Casimir’s Catholic Church was established to serve this community in 1894, and St. Mary of Czestochowa parish in 1907. The area still is home to Nest 725 of the Polish Falcons fraternal organization. AFRICAN-AMERICAN and LATINO residents moved in starting in the 1960s. It was the site of some of Milwaukee’s 1960s open housing marches, with North Booth Street resident Ald. Vel Phillips among the movement’s leaders, and Ald. Eugene Woehrer’s home on E. Burleigh Street among the marchers’ targets. Many new Latino residents were migrants from Puerto Rico. Other new residents were students at the University of Wisconsin-Milwaukee who found affordable housing close at hand. A counterculture community grew in the neighborhood in the 1970s. Outpost Natural Foods co-op opened on E. Clarke Street in 1971 and had two other locations in Riverwest before moving to its current Capitol Drive location. Many artists moved in, too, some attracted by vacant storefront studio space. A group of activists called the East Side Housing Action Committee, later ESHAC, organized the neighborhood by successfully opposing the widening of E. Locust Street in 1976. ESHAC became one of the city’s premier COMMUNITY ORGANIZATIONS before folding in 1998. It was consultants hired by ESHAC who coined the Riverwest name in 1978. In the twenty-first century, the neighborhood hosted another co-op food store and a co-op bar. It also featured an annual tour of artists’ studios and a 24-hour bicycle race. WOODLAND PATTERN Book Center and the FLORENTINE OPERA added to Riverwest’s arts cachet. Saints Casimir and Mary of Czestochowa merged as Our Lady of Divine Providence, after a patron saint of Puerto Rico. The neighborhood was one of the city’s most permanently integrated, sitting between the mostly white East Side and mostly African-American North Side. ^ Larry Witzling, George Richard Meadows, and Carol Brill, A Strategy for the Redevelopment of Riverwest (Milwaukee, ESHAC Inc. and the Milwaukee Urban Observatory of the University of Wisconsin-Milwaukee, 1978), map on cover. Today, some would not include the condominium developments along Commerce Street as part of Riverwest. See Evelyn M. Perry, Live and Let Live: Diversity, Conflict, and Community in an Integrated Neighborhood (Chapel Hill, NC: University of North Carolina Press, 2017), 28. ^ Martha Bergland and Paul G. Hayes, Studying Wisconsin: The Life of Increase Lapham, (Madison, WI: Wisconsin Historical Society Press, 2014), 186-187. ^ Northeast Side Comprehensive Plan, (Milwaukee: City of Milwaukee, 2009), 32. ^ Tom Tolan, Riverwest: A Community History (Milwaukee, Past Press, 2003), 11. ^ Witzling, Meadows, and Brill, A Strategy for the Redevelopment of Riverwest. Perry, Evelyn M. Live and Let Live: Diversity, Conflict, and Community in an Integrated Neighborhood. Chapel Hill, NC: University of North Carolina Press, 2017. Reisser, Craig. “Immigrants and House Form in Northeast Milwaukee, 1885-1916.” MA thesis, University of Wisconsin-Milwaukee, 1977. Schmidt, Deanna H. “The Practices and Processes of Neighborhood: The (Re)Production of Riverwest, Milwaukee, Wisconsin.” Urban Geography 29 (5): 473-495. Tolan, Tom. 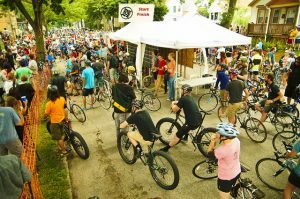 Riverwest: A Community History. Milwaukee: Past Press, 2003. The immigrants were generally poor, and many built budget houses in the new neighborhood—including at least one for only $150. Some of the houses had what Milwaukeeans call POLISH FLATS, basement apartments under single-family or duplex houses. The housing form was found often in Polish neighborhoods on Milwaukee’s South Side as well. Craig Reisser described the way these apartments were installed in his 1977 University of Wisconsin-Milwaukee master’s thesis, “Immigrants and House Form in Northeast Milwaukee, 1885-1916.” He wrote that often, the basement apartments were added after the original house was built, either as rental units or to house an expanding family. The house was jacked up, and the basement apartment added underneath. 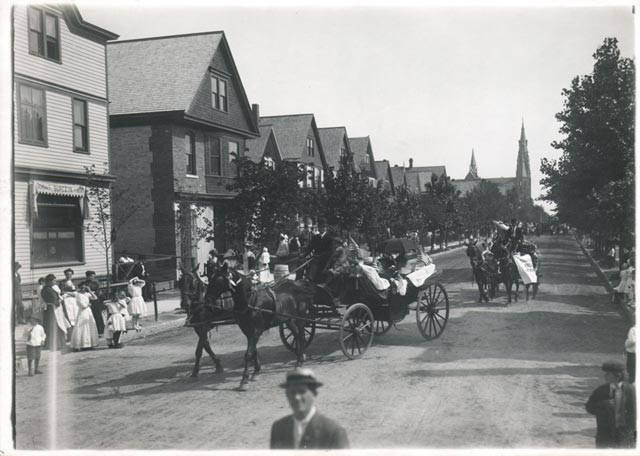 Sometimes, the original houses were moved to the neighborhood using horse power, from neighborhoods where the houses were being replaced by commercial development. Reisser also wrote about commercial development in the neighborhood, describing a common practice in which a house owner built a storefront onto the front of a residence and went into business. In the 21st century, the 2800 block of N. Weil Street had several examples of Polish flats, and the 900 block of E. Wright Street had examples of added-on storefronts. ^ Tom Tolan, Riverwest: A Community History (Milwaukee: Past Press, 2003), 38.